Member for Northern Tablelands Adam Marshall with members of Inverell Business Chamber’s Air Service Working Group, Kim Kelleher, left, Adam Marshall, Josh McPhee, Jenny Cruickshank, Wendy Wilkes and Neil Eigeland. AFTER many long years without a commercial flight service, a large crowd of Inverell residents (gleefully) assembled at the local airport this morning to welcome Fly Corporate’s 19-seat, Metro 23 turbo-prop aircraft as it arrived at 9.15am from Brisbane. 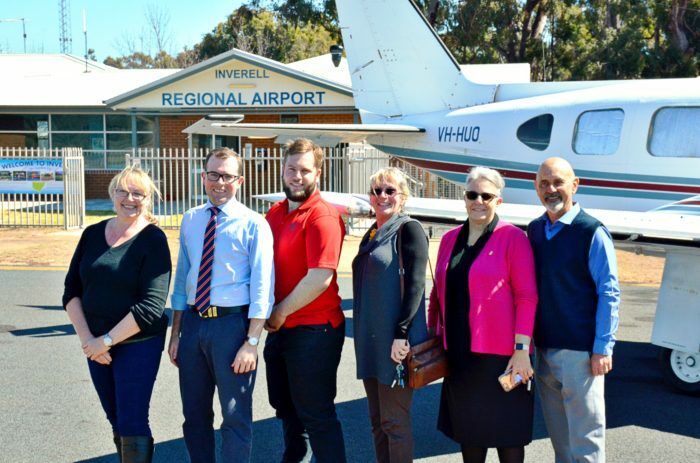 Northern Tablelands MP Adam Marshall again congratulated Inverell Shire Council and the business chamber’s Air Service Working Group on their concerted effort on presenting such a strong business case to the airline, which secured the new service. “The community has worked very hard to attract the carrier to Inverell and I’d also like to congratulate and thank Fly Corporate for providing this valuable service and choosing to be an integral part of our vibrant regional community,” Mr Marshall said. “A regular air service is an essential component of a regional community that’s growing and whether you’re in business, a tourist operator or needing access to interstate or international flights, everyone will benefit from this air service. Mr Marshall said the aircraft will depart Brisbane each morning, touching down in Inverell first and then on to Moree and arriving in Brisbane at 11.45am. “The service will operate Monday through to Friday and, with the triangulation of the route, its financial sustainability is ensured,” he said. Inverell Air Service Working Group Founder Neil Eigeland said it was a very exciting day for Inverell and was delighted the aircraft’s first touch-down at the airport had attracted such a huge crowd of well-wishers. “Everyone was clapping and cheering as the flight landed – we’ve been working on this for so long and now it’s actually happened,” Mr Eigeland said. Fly Corporate Assistant Sales Manager Sharon Elkins said the company was very happy with the support they had received from the community. “We worked with Inverell Shire Council and the Inverell Air Service Working Group (IASWG) for almost a year and were impressed with the case they presented to us to establish this service,” Ms Elkins said.